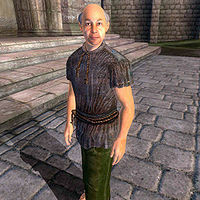 Nigidius the Needy is an Imperial beggar living in Skingrad. He sleeps rough from 10pm until 6am on a bedroll behind the city's branch of the Fighters Guild. He then wanders around the area between Summitmist Manor and the city gate until 10am before trying his luck in the triangle of road between the Mages Guild and Lazare Milvan's house until 2pm, and will then roam the steps of the Great Chapel of Julianos until 6pm. If he has found any food during the day, he will spend from 6pm until 8pm eating it, otherwise he will go hungry and stand around forlornly. He will pick up and eat any food dropped near him during this time. He then spends two hours wandering near his bedroll until 10pm before sleeping once more. Nigidius is infected with the diseases Red Rage and BrainRot, and you can be infected should you engage him in combat. He is one of the "poor and suffering" to whom you must speak in order to receive speechcraft training from Tandilwe. Nigidius certainly qualifies as poor; his only possessions are the green felt linens and sack cloth shirt he wears. For a small fee, he will provide some useful information about the disappearance of Theranis during the Thieves Guild quest Lost Histories. Nigidius sometimes appears in Summitmist Manor after the player has completed the Whodunit? quest for the Dark Brotherhood.